GB: How important will equipment (both regular and magical) be in the game? As a martial artist, will armor and weapons be few and far between? Jim: Equipment plays an important part in the game, and takes a few different forms. First, there are items that improve your character immediately and are then consumed like a scroll that you can read to raise your Spirit, or a golden pill that increases the damage you do to ghosts and demons. Second, there are items that upgrade your styles, like a magic longsword that increases your Longsword style from level 1 to level 2. Finally, there are amulet gems. These are magic gems that fit into your dragon amulet, and have a wide range of abilities. They can improve your ability scores, secondary abilities, or skills, enhance certain styles, add a damage bonus against certain creatures, or a host of other things. All of these items interact with each other, and the style system, to produce a very rich web of strategies. GB: Will players be able to recruit NPCs to join their cause and form a party? If so, how many NPCs do you plan on implementing into the game and will they have various quests, etc associated with them? Ray: We're building a huge cast of non-player characters to populate the game world, from the commoners who fill up its markets and farms, to the enemies who confront the player, to the agents who flock to the player's side to serve his cause. We want to provide the player with an immersive experience, so that when he walks through a town he feels as if he has entered a magical but somehow real world. The only boss we're ready to reveal at this point is Death's Hand, a deadly warrior seen in the trailer video. Little is known of Death's Hand besides his skill at martial arts, and the fact that no one knows his true identity. He is said to be the master of a forbidden fighting style that has no counter. The player chooses his character from a pool of archetypes that each embodies a specific character (type), such as the fast and deadly martial artist, or the powerful and stern brawler. Each of these has a default name and a starting style, but of course the player can customize these. The names of some of the playable characters include Furious Ming, Tiger Shen, and Wu the Lotus Blossom, though these are of course customizable by the player. GB: Can you describe the Marvelous Dragonfly and how players might be able to gain access to it? Will there be any other forms of quick transportation? Greg: We're exploring several possibilities for transportation, but we aren't ready to talk about them yet. We'll have more information to reveal on this later in development! GB: Tell us a bit about the various magic players can wield. Any favorite spells or effects? Greg: Magical styles are a large part of the Jade Empire players will be able to customize their characters in a variety of ways, one of which will be to primarily use magical styles. At the current time we're working out a number of interesting magic styles one of my current favorites is Paralyzing Palm it allows the player to either slow or paralyze opponents depending on the success of the player's attacks. We're still working on a number of styles that will impart on the players absolutely amazing powers! 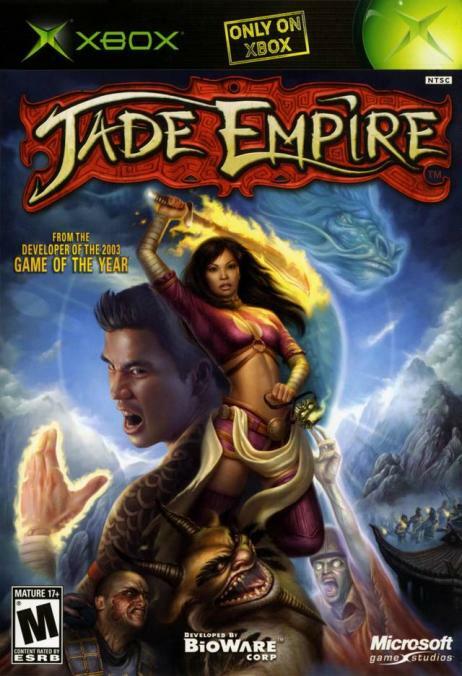 GB: Other than the unique setting, what do you feel is the most important aspect of Jade Empire that gives it a good chance of success and makes it differ from other RPGs? Jim: The unique aspect about Jade Empire is that this is a new IP developed here at BioWare. In addition to what Ray mentioned about the brand new world of Jade Empire, we designed a new rule set from the ground up for Jade Empire, using our experience working on games like Star Wars Knights of the Old Republic, Baldur's Gate and Neverwinter Nights. At the character level it's deceptively simple yet elegant and deep: each character has three primary abilities and three secondary abilities. Greg: The graphics engine has more than twice the number of render paths that Star Wars: Knights of the Old Republic had, and cool new features like physics-based cloth, rim lighting, and an entirely new skeleton built to accommodate motion captured animation. The sound engine is designed to produce the most cinematic experience possible, and puts incredible control in the hands of our audio engineers. The distinctive setting, the detailed combat system as well as the lush area and character graphics (roughly double the number of polys per character compared with Knights), the animation system (Jade Empire's animation is fully motion captured, a first for BioWare) and the storyline rich, deep and non-linear, and full of replayable options in the BioWare tradition will really set Jade Empire apart.